Yes, another view of the Taj. Today was the "long day" that Manu had mentioned. It was lengthened considerably by the mother of all traffic jams as we entered Agra at the end of the day. Agra as in Agra-vating. But I'm getting ahead of myself. Our first stop was a world-famous bird sanctuary that, sadly, had seen better days. The near-drought that weak monsoons have caused means that few of the migrating birds have come. We did see baboons, jackals, egrets, owls, mother and baby deer, mother and baby wild boar, and many others, so Anica still enjoyed it. The tour of the sanctuary was done by bicycle rickshaw, pedalled by elderly Sikh gentlemen (was it a requirement for the job? ), who narrated in thick accents. Manu rode circles around us on a bicycle they provided him, as each rickshaw only had room for two people. The afternoon stop was much more impressive, and one I'd been looking forward to. We toured Fatehpur Sikri, the famous capital built by Moghul emperor Akbar on the advice of a mystic. Akbar had followed the advice and been rewarded with a male heir. 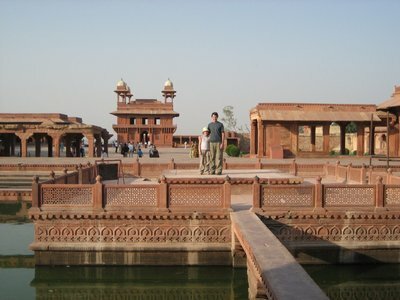 As a capital, Fatephur Sikri, high on a hill, is impressive, and it was built in just 13 years. Unfortunately, it wasn't in use for much longer than that. Lack of water, and the pull of Agra on Akbar's successors, made Fatehpur Sikri a ghost city. 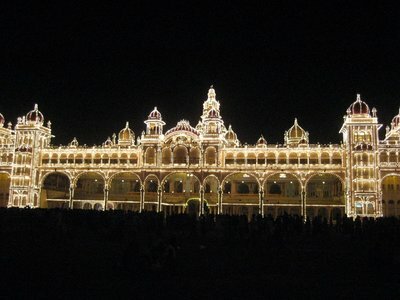 It's an incredible blend of Hindu and Muslim, and also Christian and Jainist elements in its architecture. This was Akbar's goal: to fuse all the faiths. He had a favourite wife from each religion, and their palaces are quite distinct from one another. There are whimsical touches on the grounds, such as a life-size checkerboard, where Akbar used to move dancing girls around as human playing pieces. 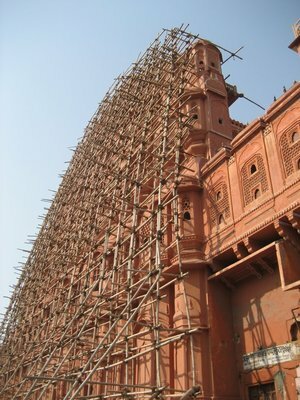 In general, Fatehpur Sikri was wonderfully eccentric and impressive. Eventually, we arrived at our hotel after driving through a good portion of Agra. I realized that this, the city of the Taj Mahal, the capital of the Mogul emperor, and a city of over a million people, is crippled by filth. Every few feet we saw men peeing on walls. The dirt coated the streets and sidewalks to the point that some roads don't even look paved. The sun tried its best, but didn't exactly shine, so much as peer, through the haze of pollution. What a contrast to the city's landmarks and history. Today we visited the Taj Mahal before breakfast. We were there just after 6 AM, as the sun was just coming up on its east face. Despite the fact that this is acknowledged as the best time of day to see the Taj, it's too early for many, so the crowds weren't huge. And yes, it is beautiful, perfect. Yes, it is worth getting there early to watch the sun draw out the whiteness, bit by bit. And, for me, having not had breakfast or coffee, the lightheadness really added to the awe I was feeling. 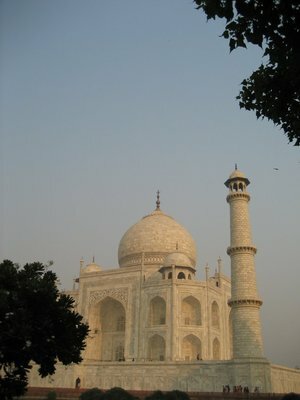 We approached the Taj through a park, coming in a sort of side entrance, which meant we bypassed the supposed hordes of beggars and hawkers at the front entrance. It made for a peaceful introduction to the grounds. At no point can you see the Taj Mahal itself until you pass through the large gate. There, like many, we paused to take a picture framed by the shape of the gate's opening. 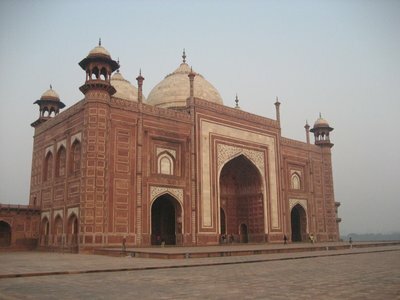 I never realized how impressive the gate was, or how perfectly symmetrical everything was, including the large, beautiful mosque on one side of the Taj Mahal, and its twin on the other, built only to preserve the symmetry. Is it the mosque, or its symmetrical twin? 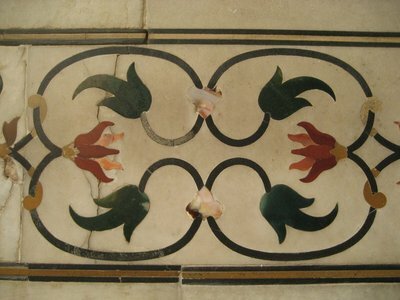 I never realized there is no paint anywhere, that every decoration we saw was done with inlaid semi-precious jewels. Incredible. When eventually we moved behind the Taj, and looked across the river, we saw how little water was in it. You almost couldn't get a boat down the river, it's so dry. That means the only place to see the Taj Mahal is from its own grounds, or from a distance, through the haze, from the Red Fort. 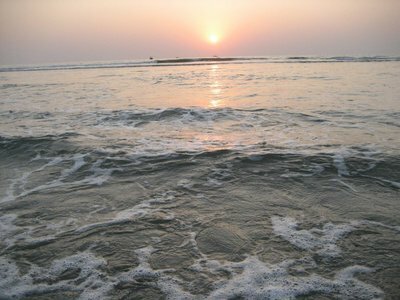 In the afternoon, we were on our own, without Manu (! 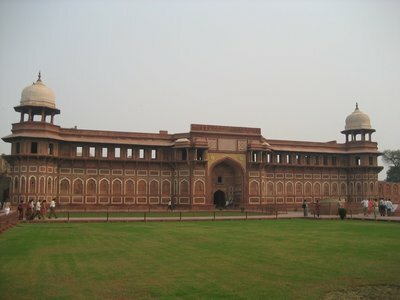 ), and decided to see the Red Fort, or Agra Fort, as its also called. This was used as the hall of public audience, palace, "harem," jail, etc. 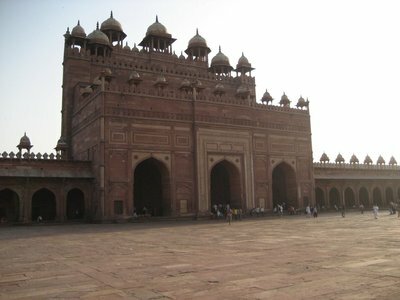 by a succession of Mughal emperors, for much longer than Fatehpur Sikri was. I'm glad we decided to visit, because again, it was simply grand, and so much to see. You can see where Shah Jahan remodelled parts of the palace from red sandstone to white marble, experimenting in what would lead to the Taj Mahal. Talk about home renovation! Anica was somewhat overwhelmed by the number of people who wanted to have their picture taken with her. Apparently she's a novelty even for Indian tourists. We had to say no on her behalf a few times because it just got to be too much. Days of transitions, days of goodbyes. Starting with a goodbye breakfast with Manu on October 30th. We offered (sincerely, in case you're reading this, Manu) that if he's ever in Canada he could stay with us. Manu really made our tour experience enjoyable. It could have been really awkward, being the only family, but he was so gracious and unassuming, and good-natured that I think we got along great. Anica had an older brother for a while! And then there were four. 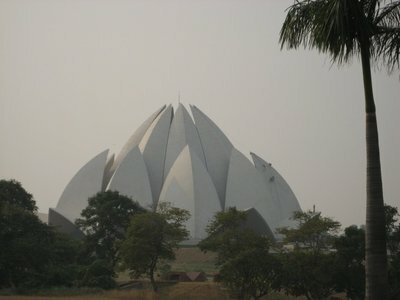 We saw a lot of Delhi, actually, including the beautiful, modern Lotus Temple of the Ba'hai faith. We started taking the subway, which, despite the pushy crowds, is one of the newest and cleanest things about Delhi. We shopped a lot with James, mainly in the Connaught Place area. These are a series of New Delhi circle-streets, radiating out from the centre, as planned and built by the British, where there's a park. Under that park is the Palika Bazaar. Yes, underground. As in sketchy. But, we spent hours haggling for cheap, pirated DVDs and other electronics. We also did some birthday shopping for Anica, making a great effort to get to a "real" shopping mall, only to be disappointed by the best Delhi had to offer (nothing like the shopping malls of Bangkok or KL). The stores around Connaught Place (i.e. the ones above the ground) are much better, particularly the many English-language bookstores. We also had the unlikely treat of meeting up with another family doing a "big world trip." Rachel and Chris, and their two daughters, are on a mirror image version of our own year-long trip and we intersected in Delhi. Despite a long day they'd had, they made the effort to meet up with us for dinner. The kids had a great time, and we traded stories and tips. They're from the U.K., and Jenn had "met" Rachel on-line. 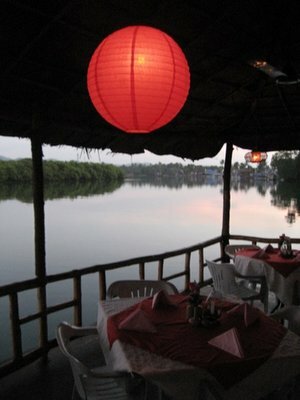 We now subscribe to each other's blogs here at travellerspoint. Then it was November 1, and time to say goodbye to Poppa/Dad/James. It was absolutely amazing being able to travel to Thailand, Cambodia and India with Anica's grandfather! All day, after he left Anica said she was still looking for him, expecting him to be beside or behind us. So, and then there were three again. A weird feeling. Jenn was really looking forward to Goa. Although we'd got a lot out of Delhi, even spending a morning at the National Museum on our last day there, it was not a city we wanted to live in, or even stay in too long. The longer you stay, the more you see of the child beggars, even naked toddlers already trained to beg, and the more you either harden or despair. Or, as we did, talk about it with our own child. 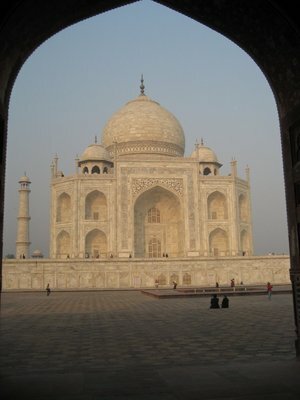 This would be the Taj Mahal. Today we got up and had breakfast with our nice tour guide Manu (very nice). Then we walked down to a ATM and got Indian Rupees and went back to hotel and rested. Then had lunch and looked at some not to big temples. One you had to cover your head. we walked to a bar and had a very big good dinner. Good night. When I think of our first days in India in the future, I will remember the smells of Delhi: smoke, exhaust, urine and dust. It's a bit of a cliche to describe India by smell, but everything I've heard is pretty much accurate. To be fair, we landed at Delhi's airport just as they're completely expanding and rebuilding it, so the first impression was a poor one. Then we stepped out and saw the old Ambassador taxis that look like they were here in 1947! Meeting "Manu," our tour guide, was a pleasure and relief. For eleven days, thanks to our signing up with Imaginative Traveller, he will take us around Rajastan, and some of the most overwhelming travel in India. Jenn and I are very happy to leave the planning and decision-making to someone else for a couple of weeks. Today, on our first full day in India, we saw some of the sites in New Delhi, including the place of Matahma Gandhi's cremation, the war memorial "India Gate", a Sikh temple (where we all covered our heads) and a Hindu temple (built in 1938, and covered, un-ironically, with swatiskas. It's Durga Puja being celebrated now (or Dussehra), and across the street from our hotel there has been a concert last night and tonight. James and I went over to check it out last night, and saw a quiet, family crowd enjoying modern rock music on a closed-off city block. The lights for Puja are already being added to for Diwali, so Delhi looks quite pretty in certain stretches. Today we went to town and saw a fancy-ish hotel. it was very pretty and old. Then we went to some Havelis. one when we got there the owner came and let us in. Me: "thank you." and we also saw a well that was 90 feet deep. then we saw the castle, then Manu said camel ride. "Yay" really hard to get up and down. then after that put on a green dress, lipstick, a scarf and bengals [bangles] for dinner. Good night. These days should be subtitled "escape from Delhi." They probably do it like this on purpose, getting you out of the big, bad city. If so, we really have appreciated it. We are now at a desert resort (I know because it's called "The Desert Resort") in Mandawa, about 250 km from Delhi. Our accomodations are "luxurious mud huts," and I hope that's easy to picture because that's a really good way to describe them. The dinner is served outdoors, as a buffet, and the view is over several kilometres of desert shubbery. There's not a cloud in the sky. This is Rajastan. The drive here was every bit as evocative and colourful as the drive we took exactly one week ago through Cambodia. The town itself, Mandawa, is known for a kind of decorated house called a "haveli." Havelis are the houses of rich merchants from the late 19th century through the first half of the 20th century. 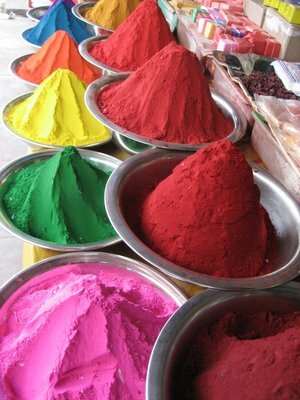 They are adorned by fresco paintings that are very hard to keep up, as they are done completely in authentic local vegetable dye colours. In Mandawa, there are 45 such houses, and other than a couple that are now hotels, they are vacant. We had the good fortune, however, of running into a family from Calcutta who was visiting their haveli property here, the house of their ancestors. They only make the trip twice a year, and don't stay inside the house, but as they unlocked the door, they invited us in to look around. Anica had her picture taken with their daughter, who is almost a year to the day older. Each haveli is a courtyard home, with two stories, and the paintings cover the inner courtyard as well. Some have a theme, like one of the hotels, which was devoted to Krishna, or another done in art deco. It's certainly a unique feature to this part of Rajastan. The next day, unfortunately, James became the first victim of some Indian indigestion. He missed out on an afternoon camel ride and a dinner at the local castle. Anica overcame her initial fear to quite enjoy the camel ride. As I looked out over the desert landscape, I couldn't help but think that the scene was one that hasn't changed in centuries. That is, until the camel driver's cell-phone sounded. We rode for about half an hour, until we came to a farmhouse (if that's the right word). There, we met the family and they served us tea. Indian tea is all boiled together, not steeped, and their milk was from their buffalo. Then we thanked them and rode the camels back to the resort. We enjoyed the resort, including the playground and pool, except for the fact that there were many wasps. Manu even got bit by one that crawled down his shirt! That made relaxing by the pool a bit of a challenge. A mere three hour drive today, and we're in Jaipur, the "pink city." There are many historical buildings here made from the local pinkish sandstone, and the old city has officially been "pink-only" since it prepared for Prince Albert's visit in 1876. That, combined with the 400 year-old city walls, and the fortications looming over us cliff-side, make Jaipur a very striking city. 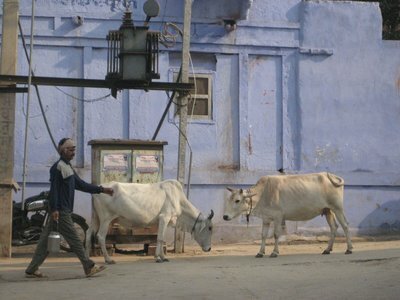 As with the other places we've been, cows are roaming freely through the streets. This I'd heard about all my life..."sacred cow" and all that. What I never imagined, however, was that monkeys, pigs and goats would also roam freely in a city of several million people. We first noticed the goats, when we saw a few on a second-floor balcony! We were taken out to the Amber Fort today (which is not named for the colour). The combination of sandstone and marble, and also the detailed work in marble and carving, make it very impressive. Unfortunately, the lake below the castle is almost dry, and some of the fort is undergoing major restoration (such as the gardens). Still, it was neat to walk through the "women's quarters," with twelve apartments for twelve wives, and look out through marble lattice to the outer courtyard. Our local guide, Mr. Pram, seemed to be the dean of all local guides, and spoke very passionately about his Rajput ancestors. After a Jeep ride back down the moutain, we stopped on the way back to town to take pictures of the "lake palace," or summer home, which does indeed seem to float on the water. Today we got up and had breakfast and went to the city palce and took a look around it. Beatiful. and the family still lives here. neat. Then we had lunch and we saw a Bollywood movie called Dhamaal. One time a grownup was bargaining to a kid. Then had diner. Good night. A second (final) day in Jaipur, and we were with Mr. Pram again in the morning for a tour of the City Palace. 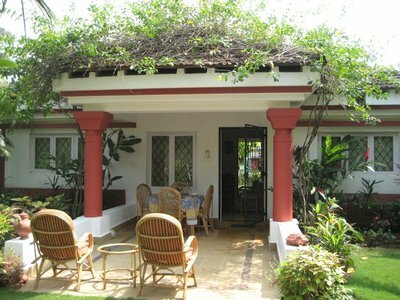 The former Maharaja's family are still in residence here, a fact that greatly impressed Anica. First, we saw the ancient, royal observatory. These monumental instruments look at first like a giant, abstract sculpture garden. Their design just seems so impossibly modern, and yet they were built in 1728 and are each highly functional. There's a large sundial at an angle of 27 degrees, for instance. We, of course, set our watches to it because it's so accurate. There's another set of astrological platforms to measure each birth sign's position in the heavens. After the Observatory, we saw a collection of the royal clothes, another of weaponry, and admired the beautiful, pink-walled courtyard, and the inner courtyard with the colourful peacock gate. Anica had her picture taken by a couple of Indian tourists; suprisingly to us she attracts quite a bit of attention here, too. One gentleman from Calcutta gave me his card (film-maker) by way of a thank-you. There were also many pigeons about, because they're considered auspicious in Jaipur. Mr. Pram said you might get away with killing a man in Jaipur, but never a pigeon. In the afteroon, we went to a 3:00 PM showing of a new Bollywood comed called "Dhajmaal!" Manu and our bus driver were with us, too. It was light-hearted, and slapstick silly, and even in Hindi, the plot was easy to follow. We went out to dinner tonight...on our own (gasp!). Manu was so worried; it was cute: "Do you know how to get to the restaurant? Will you walk? Do you have the hotel address? Call me on my cell if you need me?" Well, we did just fine, although this is a very dirty city to walk around in. The beggars and hawkers, however, are not very persistent or bothersome. Dinner was delicious; it was south Indian vegetarian cuisine. They also made great ice cream desserts, and we all indulged in that. The restaurant was the first one we've been in here in India where we were the only visible Westerners. Maybe it's a coincidence, but Jenn and I thought that it was the best meal we've had so far in India. After another stunning drive, we arrived at the "Ankur Resort" in Ranthambhore in time for a quick swim before climbing into an overgrown, open-top jeep. This was the vehicle that took us through Ranthambhore Nature Reserve for the better part of three hours. Seeing a tiger, the main attraction, is actually pretty rare, and we had no such luck. 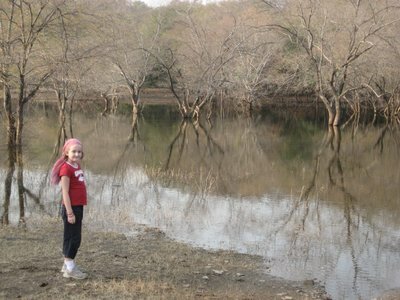 We did see monkeys, spotted deer, (unspotted) deer, a mongoose, crocodiles (from a distance). Lots of deer and birds, actually. When they gave the alarm call, our jeep's driver took off in pursuit of the tiger that was surely coming. But no, despite the thrill of the chase, we never glimpsed a tiger. The park, however, is beautiful: hilly, with riverbeds running all along the road. In some places, there's a panorama; others the branches closed in our vehicle and we had to duck our heads to prevent being scratched. Once Anica figured out to avoid being injured, she enjoyed the ride itself. We also stopped beside a clear, still lake, which reflected the trees that ringed it. We arrived on the 26th of October in Karauli, to stay at the former Maharaja's palace. The Rajastani town of Karauli is much more off the beaten track that I would ever expect to see on a packaged tour. Driving here, we passed along a single lane road through several farming communities where people seemed very surprised to see who was inside our van. Sometimes children would run alongside our van, waving and smiling. The other drivers, however, were more aggressive than friendly. Very few oncoming vehiciles gave way at all, forcing us onto the dirt shoulders. It was best simply not to look, I found! The Maharaja's residence is now one of faded glory and assorted curios. James and I had a veritable apartment to stay in, with a sitting room, a two-room lavatory, and numerous french doors and shutters. The rooms looked on the inner courtyard, where various size tables were set up for the meals to be served. At night, the full moon rose over the wall and shone down on the center of the courtyard. Anica enjoyed being shown around the grounds. They keep four horses, some cows, rabbits, budgies, turtles and dogs, for example, on the property. They have a collection on panquins and of vintage cars. There was a swimming pool, which Manu described as "old-fashioned," before we saw it, but that we described as murky and univiting. There was a really cool billiards room, and we did play, but the undistubed dust was thick, and not all the snooker balls could be found. Like I said, faded glory. At their "city palace," which we toured on the morning of the 27th, we were the only ones there. They opened up the rooms and buildings piece by piece, sometimes pointing the way with a flashlight. We couldn't believe how immense the palace was. And the oldest part of it was built in 1348! Much of it was fairly well-preserved, and very much worth seeing. 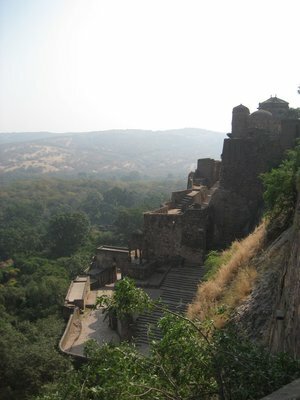 Yet, many guidebooks, including our Rough Guide to India, don't even mention Karauli, or its city palace. The best part about Karauli was walking through the town and its market streets. The people were so friendly: everybody waved and said hello, and nobody was begging or trying to sell us anything. The people here also like to greet us with "ta-ta," which (thanks to the British, I guess) we heard over and over in a singsong tone. I joked with Anica that we must be the "ta-ta" people. To our eyes, they are poor people, but not desparately poor, although the region is practically in drought conditions. The main business seems to be the quarrying of the red sandstone from the surrounding hills. The open sewers, and crowded, rough housing is quite a contrast, however, from the Maharaja's holdings. We met her highness, the latest Maharaja's widow, who was very gracious and welcoming. I wonder how the family is regarded in Karauli, because the property they own dwarfs everything else in town, even the temples. When we took a camel cart ride (the equivalent of a horse-drawn wagon ride back in Ontario) in the late afternoon, we headed out of the town to a nearby lake, the dam for which was built over 400 years ago (although not considered a "historical" site, so I'm glad I asked about it). The people in the homes we passed came outside to greet us, and some children biked or walked alongside us. It wasn't at all intimidating, though. In fact, when we got to the lake, Anica saw that there was some playground equipment. She climbed and slid for an audience of children for the first few minutes, but then the novelty wore off and they all played together. Leaving Karauli, we once again had that wonderful, bittersweet feeling of not wanting to go, of having found a place we really enjoyed staying at, and could have stayed longer.